The UK food chain is a complex industry with agriculture at its heart. With sales of over £220 billion per annum in 2017, the industry generates a GVA of over £110 billion and employs 3.9 million people. Despite this, the UK only produced 60% of its own food in 2017. In January this year, the British Retail Consortium and leaders of top food retail outlets wrote a letter to the government warning of the effect a no-deal Brexit would have on food supply. The National Farming Union president Minnette Batters has also been vocal in the impact Brexit is likely to have on British Farming and food security. The World is seeing increased demand for food with most projections suggesting this will continue. Globally the number of hungry people is increasing and rose by 15 million to 821 million in 2017. There have been many reports highlighting these needs and predicting that in order to meet food needs in 2050, global agriculture needs to increase food production by 70% from the levels it achieved in 2010. This fourth agricultural revolution will therefore require us to change the way we work on the land and invest in its future, will force us to reform the role of Government in regulating and supporting farming; will demand new thinking and new talent in food production, and will, inevitably, require tough choices to be made. – Rt Hon Michael Gove MP, at Oxford Farming Conference 3rd January 2019. 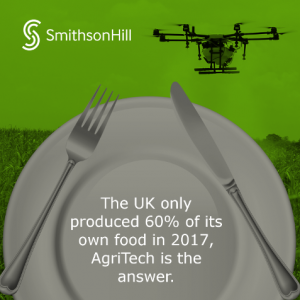 It is definitely time to call in the cavalry – AgriTech is a key solution to these challenges. The Knowledge Intensive cluster based around Cambridge is perfectly placed to make the most of this opportunity.